So, for all the fine books on Art History and studies of the Urban Condition, photography monographs and the odd bit of Barthes or Berger or the latest post-modern Murakami or magical realist Garcia Marquez , what's your escapist reading? I know some who won't admit to spending a night or two with the latest Tom Clancy novel. I'm waiting for the new Michael Ondaatje book to arrive at the library - heavy duty stuff - but I read once the Ondaatje likes to relax with a good detective novel. Which is probably my choice too. Most recently my favorite has been the Inspector Wallanader series from Henning Mankell. A middle aged small town Swedish detective who worries about his daughter and his cholesterol (hmm...). He also comes up with some surprisingly thoughtful lines about life in general. Then there's the Commissario Brunetti series - though he seems to spend more time wandering around Venice than actually solving crimes (and I usually end up just wanting to spend Spring sipping espresso's in some small Venetian bar). I also like the Inspector Rebus series, although Rebus is is bit to close to self-destruction from cigarettes, booze, neeps and tatties for comfort. Finally of course, there is the fictional detective who's also a photographer. 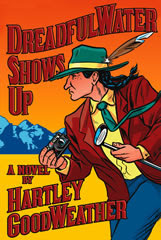 Thumps Dreadfulwater a native American photographer/retired cop. There are only two books in the series so far and they are actually pretty good and quite funny in places as well. The protagonist uses a Leica M6 and a wooden 4x5 Field Camera. Written by Hartley Goodweather - which is the pseudonym for award winning author Tom King - whose more serious novels are also first class (Btw, Tom also enjoys using Dagor lenses and doing the Pyro dev thing - he really is a photographer as well as a novelist).